There are 2 styles of martial arts native to Sri Lanka, these are Cheena di and Angampora. Cheena di was taught by Chinese monks to locals when they made pilgrimages to see Buddha's footprint and tooth. Relics that are still on display in Sri Lanka. This is the more popular style of the two. The other Style is Angampora and it is the style taught to soldiers during the pre-colonial period. However, during the European rule, this fighting style was banned. As a result, it was taught in secrecy and is still taught only to a few. 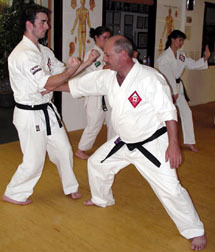 This style also employs a unique weapon consisting of a metal whip with serrations. Due to a lack of teachers and the length of time it takes to master either style, the number of practitioners are in the decline. Karate, boxing, aikido and the more well-known martial arts have become popular in Sri Lanka surplanting the traditional styles. Literally "Chinese Punch". It is an ancient Kung Fu style of Sri Lanka.Legend has it,this style was taught to the Sinhalese by Shaolin Monks who came to see the Tooth Relic. 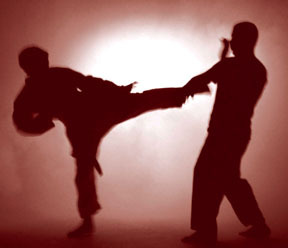 It is now rare, as Karate, Wushu, Aikido, Jujutsu and Judo are the more popular styles in Sri Lanka. It takes 15 years to master the style and teachers still teach using the Orthodox Methods and it takes 15 years to master it. Another Sri Lankan Martial arts were fostered from the Indian martial arts tradition. Ancient India was one of the centres of several martial traditions and practices. Some of the older traditions include organised martial systems as practised by the Kshatriya caste of Hinduism, which are some of the oldest descriptions of organised martial practices documented in the Rigveda, these systems include armed and unarmed combat and aspects such as meditation, conditioning, horse riding etc. Organised martial arts in India include the ancient martial art of Malla-yuddha (more commonly known as Mallayuddha), which is described in the Indian epics as the fighting style of warriors such as Bhima. The art is supposed to have gained maximum prominence in ancient India at the time when the oral tradition of the Mahabharata epic was conceived, the Mahabharata was compiled in textual form during the 5th century BC, the epic's setting has a historical precedent in Vedic India, where the Kuru kingdom was the centre of political power in the late 2nd and early 1st millennia BCE. It is believed that mallayuddha was regarded as a prominent martial art in that era. Martial arts of India are diverse in nature and have origins of different times from various different ethnic groups of ancient India. A number of ancient and sophisticated Dravidian martial arts were developed in South India including Kuttu Varisai (empty hand combat), Varma Kalai (the art of vital points) and Adithada (kickboxing) in Tamil Nadu, and Kalari Payattu (way of the arena) in Kerala. Dravidian martial arts was influential in various Indianized kingdoms of Southeast Asia. Many relevant martial arts, including those emanating from the Shaolin temple , Tsutsumi Hozan Ryu Jujutsu , Goju Ryu Karate  and Brazilian Jiu Jitsu have officially credited India as their origin. Legend holds that Bodhidharma (Chinese: Ta Mo; Japanese: Daruma) was the third child of the Pallava king Sugandan from Kanchipuram, Tamil Nadu. He trained in breathing exercises and combat, namely in the arts of Varma Kalai and Kuttu Varisai. Bodhidharma also studied Dhyana Buddhism and became the 28th patriarch of that religion. Following the death of his master, Bodhidharma travelled to China to spread Buddhism. After appearing in the court of emperor Wu-Di of the Liang dynasty, he settled down in the Shaolin, in the province of Henan (northern China), where he is said to have installed many martial practices leading to the development of Chinese martial arts such as Kung Fu. In the monastery, Bodhidharma lived for 9 years and is also credited for the development of Zen Buddhism.Alex Doss, President of the Tamil Sangam at San Diego State University, claims India to be a founding influence for the development of martial arts such as Bando, Lethwei, Muay Thai (kickboxing), Bersilat, Silambam, Pentjak Silat, Kali, Escrima and Dumog (wrestling) citing that these arts developed either in Indianized kingdoms or in kingdoms having very close ties with ancient India. The occupation of India by England was instrumental in the decline of Indian martial arts. The British raj saw the suppression of several Indian martial arts to obscurity. The rule of the British also saw Indian economy turn from the wealthiest in the world to the poorest, leading to widespread poverty, illiteracy, overpopulation and the ultimate breakup of India into many smaller countries. During the recent years, Indian martial arts have become obscure, with many martial arts becoming extinct and others turned into combat dances.